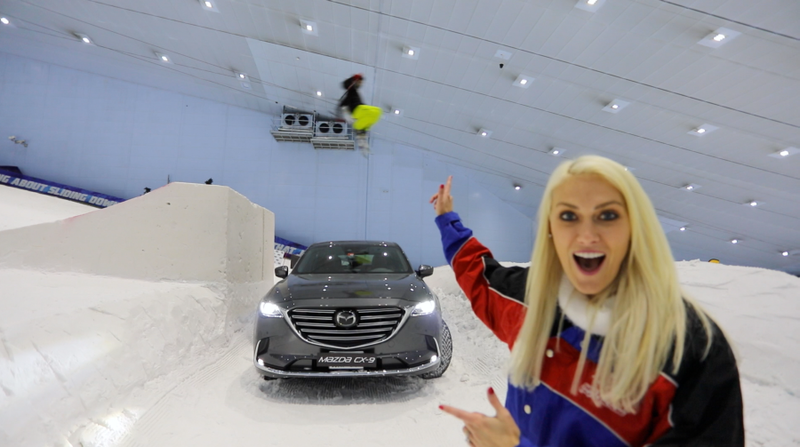 Influencer and supercar fanatic Alex Hirschi (aka @SuperCarBlondie) pulled off Dubai’s biggest ever ski stunt at Ski Dubai at the Mall of the Emirates in Dubai, with the support of Mazda and Continental Tires. Hirschi began the stunt by towing Emirati professional skier, Hassan Fardan, to the top of Ski Dubai’s artificial slopes in the New Mazda CX-9 Signature Line SUV fitted with Continental Tires’ specially-made snow tyres. She then drove to the bottom of the slope, while Fardan himself raced down. During the run, Fardan hit a jump and gained enough height to clear the Mazda SUV. The new Mazda CX-9 Signature Line SUV was the car used for Supercar Blondie stunt at Ski Dubai. CX-9 represents a capstone for the new generation of Mazda cars and crossovers and a high-end model indicating what is to come with innovative powertrains, engaging driving dynamics, premium quality and the evolution of the award-winning KODO—Soul of Motion design ethos. With those qualities, Mazda aims to build the most emotionally stirring, captivating vehicles in the industry, elevating its brand to new heights around the world. Having achieved great success for the Mazda Motor Corporation in the UAE for over 45 years, Galadari Automobile Co. Ltd. (GAL) is a leader in the automobile sector in the UAE with showrooms in Dubai, Abu Dhabi, Al Ain, Ras Al Khaimah and Fujairah. By providing world-class automotive products and ensuring high quality after-sales servicing and customer support, GAL has established a reputation as a pioneer in automotive sales and earned the trust of thousands of satisfied customers. Continental develops pioneering technologies and services for sustainable and connected mobility of people and their goods. Founded in 1871, the technology company offers safe, efficient, intelligent and affordable solutions for vehicles, machines, traffic and transportation. In 2017, Continental generated sales of around €44 billion and currently employs more than 240,000 people in 61 countries. Continental ranks among the technology leaders in tyre production and offers a broad product range for passenger cars, commercial vehicles and two-wheelers. Through continuous investment in R&D, Continental makes a major contribution to safe, cost-effective and ecologically efficient mobility. The Tire division’s portfolio includes services for the tyre trade and for fleet applications, as well as digital management systems for commercial vehicle tyres. Launched in 2017, ITP Live is the region’s largest full service social media and influencer marketing agency. From exclusively managing digital content creators to conceptualizing and executing 360-degree influencer marketing campaigns for international and local brands, ITP Live is a dynamic new division of ITP Media Group. In addition to creating ROI-focused influencer campaigns for its clients, the division is also responsible for organizing bespoke events with global influencers, including influencer marketing conferences with industry experts and hosting social media workshops, for aspiring content creators within the GCC.